Prime Minister David Cameron wrote to Rt Hon Iain Duncan Smith MP following his resignation. Thank you for your letter this evening. We are all very proud of the welfare reforms which this Government has delivered over the last six years, and in which you have played an important part. As a Government, we have done a huge amount to get people into work, reduce unemployment and promote social justice. There are now more people in work than ever before in our country’s history, with 2.4 million more jobs created since 2010. I regret that you have chosen to step down from the Government at this moment. Together we designed the Personal Independence Payment to support the most vulnerable and to give disabled people more independence. That is why we collectively agreed – you, No 10 and the Treasury – proposals which you and your Department then announced a week ago. Today we agreed not to proceed with the policies in their current form and instead to work together to get these policies right over the coming months. You leave the Government with my thanks and best wishes. 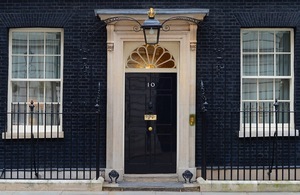 While we are on different sides in the vital debate about the future of Britain’s relations with Europe, the Government will, of course, continue with its policy of welfare reform, matched by our commitment to social justice, to improving the life chances of the most disadvantaged people in our country, and to ensuring that those who most need help and protection continue to receive it.